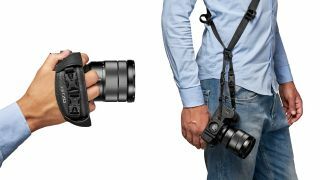 Photography accessories brand Gitzo, best known for producing high-end tripods, has announced a new line of premium camera straps. The straps, branded as the Gitzo Century Camera Strap Collection, are made from Italian leather, with a "unique carbon-fibre" look that Gitzo says is reminiscent of the its tripod legs. The Century system comprises interchangeable straps, which the company says will ensure a perfect fit and optimal comfort, with different elements able to be combined thanks to the exclusive G-lock safety buckles. Let's take a look at the straps in the range. First up is the Century Sling Strap, which is designed to provide easy of access to your camera and offer all-round comfort. The cross-body design is said to hold the camera comfortably to the side of the photographer’s body, keeping equipment securely in position. The Century Sling camera strap is compatible with all DSLR and mirrorless cameras with a standard 1/4-inch tripod screw, with a new Gitzo GS5370SDR quick-release plate with rubber grip attaching to the camera. The UK price will be £79.95, with pricing for other regions to be confirmed. The Century Neck Strap features a suede-like texture that designed to keep your neck comfortable. Equipped with both a ring-type camera attachment system and a universal 10mm band attachment for standard camera loops, it will securely hold most full-frame cameras, rangefinders and premium CSC cameras and is priced at £99.95. The third strap is the Century Hand strap (£59.95). Again, this is compatible with all DSLR and mirrorless cameras featuring a standard 1/4-inch tripod screw, with the new Gitzo GS5370SDR quick-release plate with rubber grip enabling photographers to attach their camera to a tripod with the strap still in place. Finally, there's the Century Wrist camera strap (£44.95) for mirrorless cameras. There's a choice of an anti-scratch ring-type camera attachment system, or a universal 10mm band attachment for standard camera loops.